Good news! 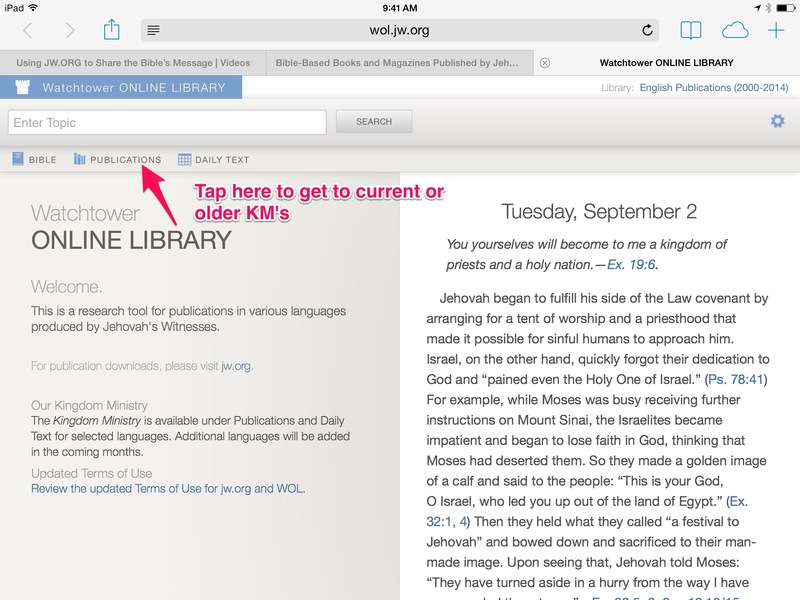 You can now access current and older (back to 2010) issues of Our Kingdom Ministry online at wol.jw.org! You can get to the KM’s through three methods. 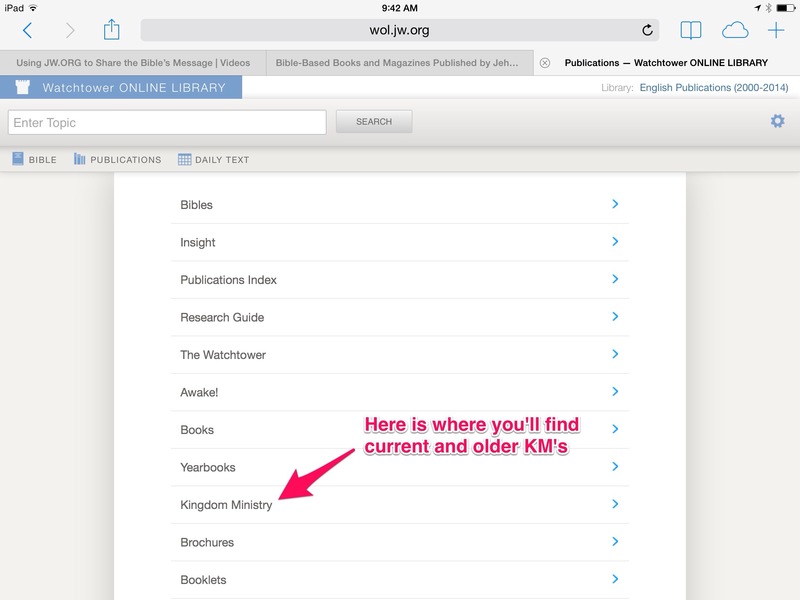 The first method allows you to download the Kingdom Ministries to your computer or mobile device for offline reading. 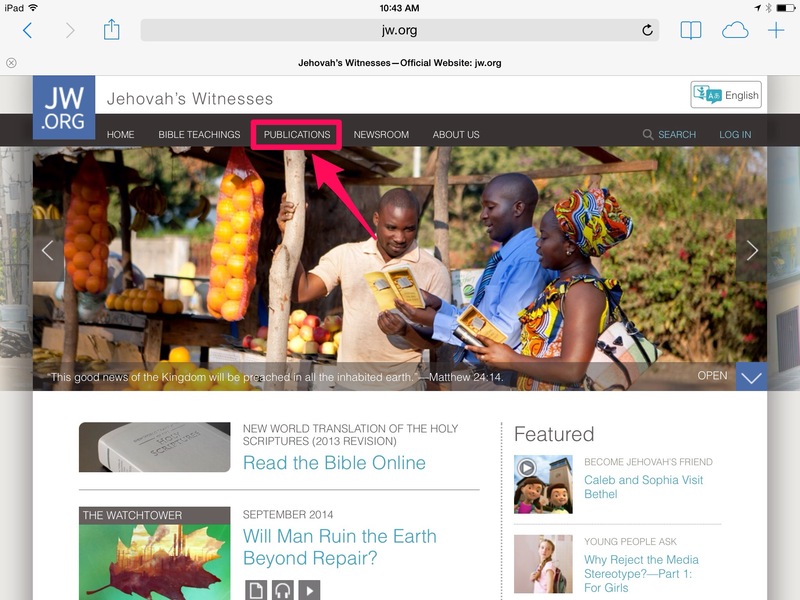 First go to jw.org and tap on the “PUBLICATIONS” link. Then scroll down to “KINGDOM MINISTRY” on the left menu. Tap here and you’ll now be able to see the various issues and file formats. 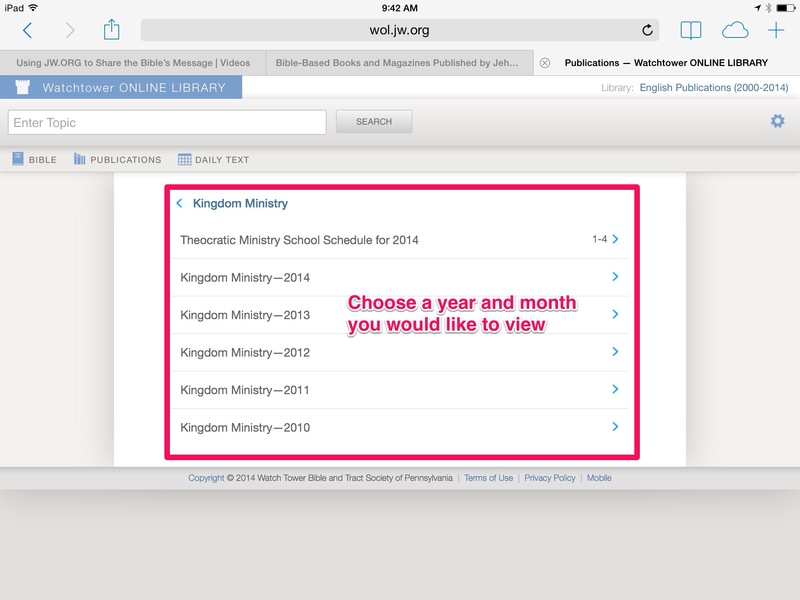 Select EPUB format if you’d like to view the Kingdom Ministry in iBooks. This is a nice format because it has links to scriptures and reference articles. 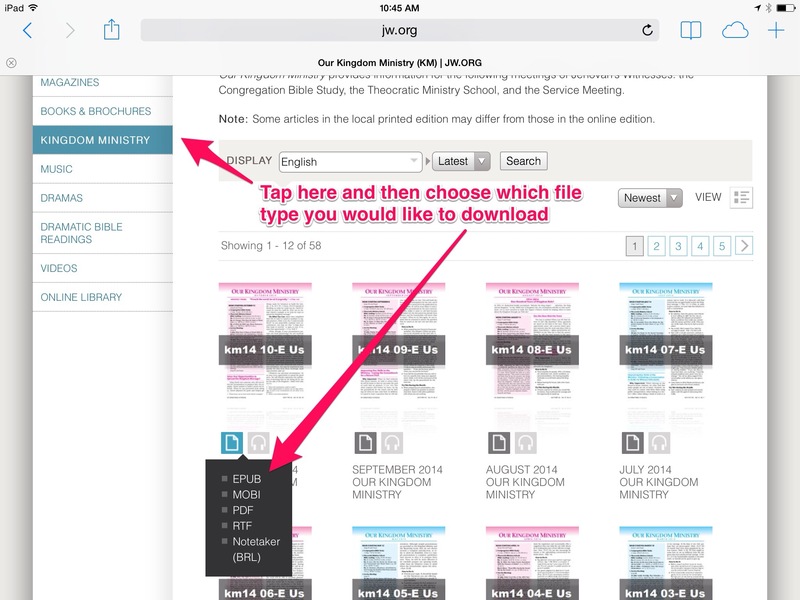 If you prefer to use a file management app like PDF Expert or Documents, you’ll want to download the PDF version of the Kingdom Ministry. Or, if you want to have the best of both worlds, you can make a PDF with live links following this tutorial. The other two methods give access to the Kingdom Ministries through the Watchtower Online Library. Go to wol.jw.org on your computer or mobile device. Then simply tap on the “DAILY TEXT” link just left of center. Now you will see today’s text and underneath you’ll find this week’s meeting material schedule. 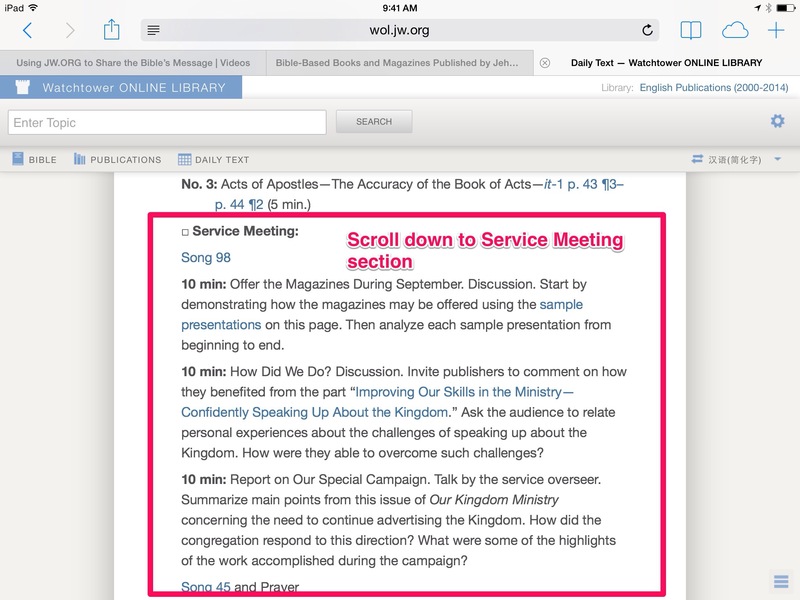 Prior to September 1st, no Service Meeting material was available. But now its all here! 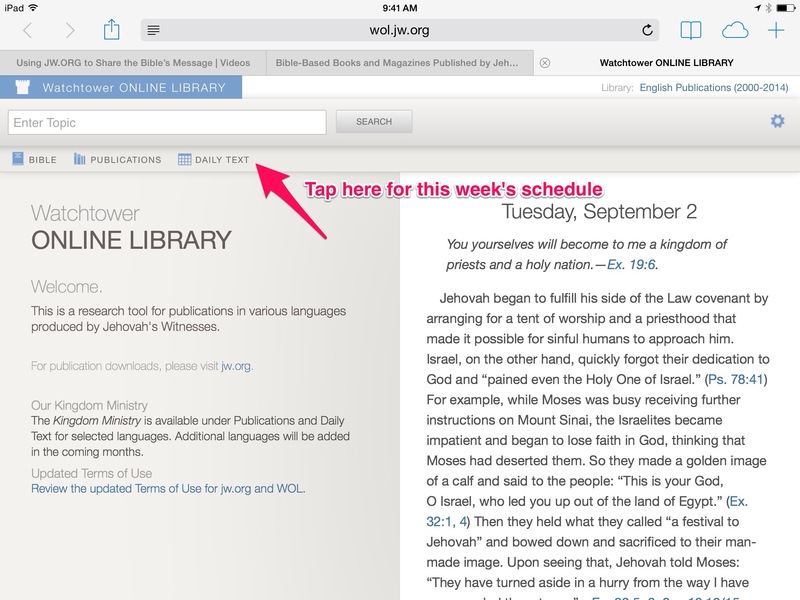 You can navigate to different weeks by tapping the arrows above the Daily Text. The third method gives access to the back catalog of Our Kingdom Ministry issues all the way back to 2010. Again, go to wol.jw.org on your computer or mobile device. Next, tap on “PUBLICATIONS” in the upper left. Scroll down and tap on “Kingdom Ministry”. Now you can choose the year of the Kingdom ministry you want. One the next screen choose the month. Now you’ll be able to see the title’s of all the articles of that month’s Kingdom Ministry. Now you are free to navigate within Kingdom Ministry articles and visit other reference publications that are linked within. And don’t forget to check out other languages too via the Synchronize feature. These other languages can even be read to you by using the built-in Speak Selection feature on your iPhone and iPad (more on that here). I hope this tutorial helps you get more out of your personal study using the Kingdom Ministry! Or, if you want to have the best of both worlds, you can make a PDF with live links following this tutorial. <<<<<< Can you sent the link to the tutorial mentioned above. I hope that while viewing the KM – the scriptures will link back to the Bible. By the way I use Equipd for everything, except for the KM's – and use Easy Annotate for the KM's to be able to highlight. I love Equipd and can’t wait for it to get updated with KM’s.